Snapshot from the KEGS Prospectus.. ethos projection at work. School of the future? What’s your vision? In writing this series, I’ve was continually reflecting on my own leadership. I’d agreed with my Governors that, this year, a 360 review would be a useful addition to the information presented as part of my annual review. I looked at a couple of other models but found that they were too highly structured and/or didn’t tell me things I wanted to know. The process was that I put forward a list of members of staff, taking a cross-section of roles in the school. The lead Governor then selected a sample of 8 to 10 people from that list, without tell me who, asking them to take part in the process. 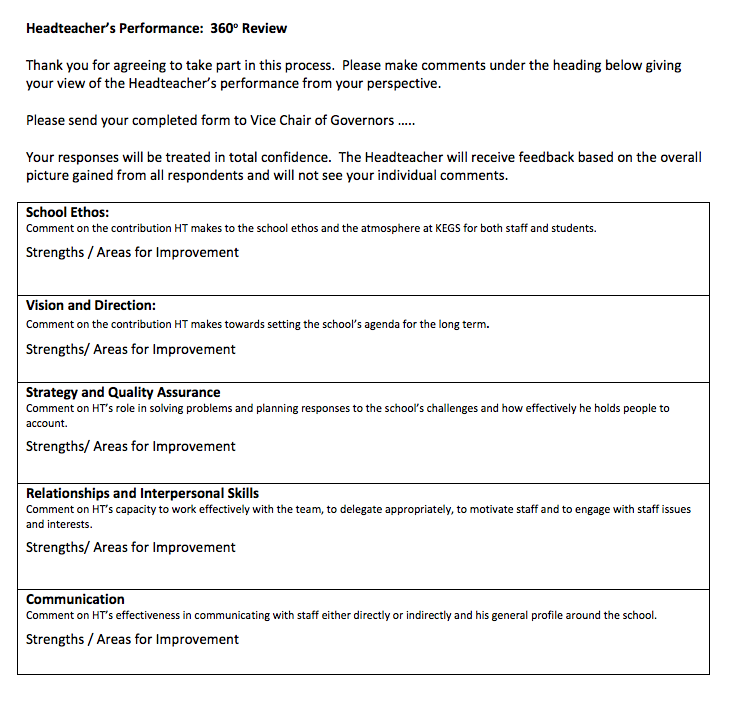 The responses were compiled and written up by an external consultant, someone who has been involved as our SIP and who knows me and the school well. I know that other 360 processes are done openly – ie the responses are attributable. However, this randomised, anonymous method has worked in my case. I’ve received a good balance of positive and encouraging feedback with some honest comments about areas I can improve. I don’t need or want to know who made the more critical comments; the write-up has been crafted in language that makes all comments non-attributable and also allows me to absorb the feedback constructively. Most of the areas to improve are things I am well aware of and readily acknowledge; there are some where I feel I may just need to manage perceptions rather than the reality. On some issues, different respondents have conflicting perspectives.. but that is part of the value of this process. There are one or two areas where I’ve had to have a proper word with myself – where, without the 360, I might not have been aware of at least one person’s concerns. That is incredibly valuable. So -for me, it has worked. I will be writing an action plan for myself and my Governors showing how I’ll address the issues raised and that will help me both personally and professionally. It will also help my school to move forward, making it a better place to work and to learn. At least that’s the plan! I hope the Great Leadership posts help others to have similar reflections, with or without the 360 feedback. We can always do better. Good to read this, Tom. Now in the ‘post-headship’ phase of my life, I am doing quite a few heads’ and senior leaders’ appraisals/professional reviews. I’m really interested in the process and how to make it as positive and productive as possible.